NEW YORK (CNNMoney) -- How's this for holiday savings: a shopping haul of remote control cars, tablets, warm coats and boots worth $8,000 for just $1,300. 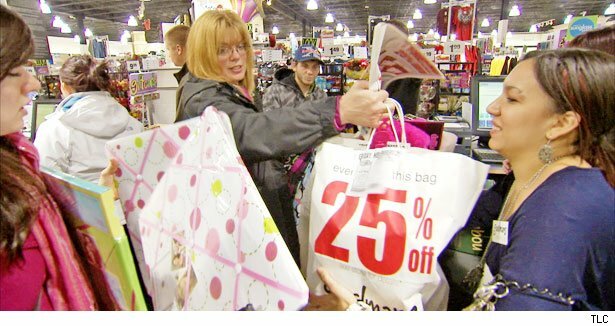 That was how well extreme couponer Joni Crothers and her "coupon-tourage" of 14 friends and family members did after 15 hours of shopping at 10 stores in Toledo, Ohio, on Black Friday. It works out to about $450 an hour in savings. There's a cherry on top of this shopping spree. It will be used to fulfill wish lists from 16 children in need. The group met at Crothers' home at 7:15 p.m. on Thanksgiving, earlier than their 9 p.m. start last year, since stores like Wal-Mart (WMT, Fortune 500)and Toys R Us pushed their doorbuster sales up by an hour. The crew then fanned out to Toys R Us, Wal-Mart, Target (TGT, Fortune 500), Kohls (KSS, Fortune 500), Bath and Body Works, Macy's (M, Fortune 500), JC Penney (JCP, Fortune 500) and Aeropostale (ARO) -- stores that Crothers determined had the greatest number of items on the children's lists.